It is a nostalgic month in the world of video games it seems as after the fun Citadale: The Legends Trilogy that I reviewed yesterday comes A Robot Named Fight which is another retro throw back to the classic days of yore. This time around the inspiration is Metroid, and specifically the Metroidvania (one huge 2D level) style of Super Metroid as the graphics are 16 bit and the sound is authentic to that time. This has a difference though in that the game is a Metroidvania in style but has roguelike elements thrown in, in that you only have the one life and the game is procedurally generated so no two playthroughs are the same. 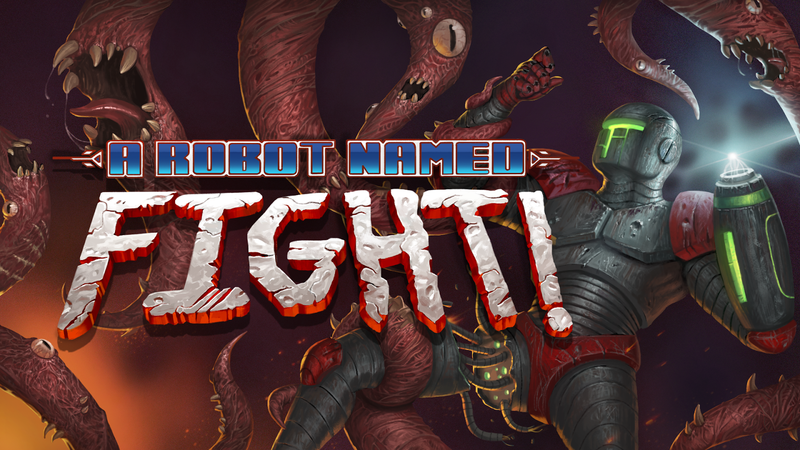 A Robot Named Fight is fantastic and like the best roguelikes it is extremely addictive with that 'just one more go' feeling perfected. I love how like Metroid it really is. This is a 2D platformer that is one huge maze like level made up of hundreds of smaller rooms. You play as a robot armed with a cannon and as you progress you can collect upgrades that both make you more powerful (such as extra health, guns do more damage and increase your speed) and unlocks more skills for you that help you get to places in the levels that you couldn't previously get to. Rockets can destroy metal doors for example, while the spider ability allows you to navigate narrow spaces. Elsewhere you can get a double jump to reach high places, eventually unlocking a jet pack. There are also suit upgrades that let you survive in hot areas, torches to light dark places and so much more. Each playthrough is different and so every time I played I unlocked different abilities and upgrades. There are around 5 or 6 different areas in the game, each one themed on a different location, from the mechanical looking start area to caves and a buried city that gives you some visual clues as to what the world used to be like these areas are laid out in a similar fashion but bring with them their own enemy types, with each new place having tougher monsters to fight. Each area ends in a boss fight that like the rest of the game is random so there are a variety of ones to fight from floating bird like blobs to a screen filling monstrosity that spews out vomit at you. 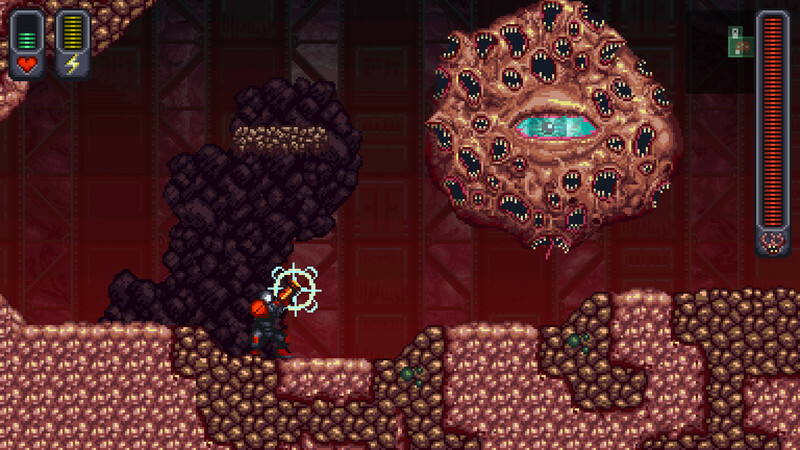 This is not as big as Super Metroid but is cohesive and fun to fight through. It all culminates in a final boss that doesn't as much fill one screen as fills many, so much so that the camera pans out and you become a little spec on the screen. This made it look epic but made it also really hard to keep track of where you are and where the enemies and projectiles coming your way are at. Like many roguelikes it really depends on blind luck if you get a fighting chance of winning or not. In my playthrough that got me to the end I was blessed not only with electricity spewing missiles, but also ones that were super sized and able to pass through scenery making all the enemies very easy to blow into bloody chunks. 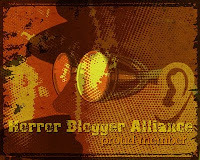 All the monsters are similar in look, flesh coloured creatures that come in many forms, from the weak maggot type fodder to armoured wall mounted missile throwing things and ones resembling animals. If I had a complaint about the design I guess the fact they all have the same colour to them means they do blur into one a lot, but then they are easy to recognise as the foe. Some roguelikes like Rogue Legacy see multiple playthroughs granting you XP, here the only change is that the further into the game you get and more bosses you kill the more secret power-ups you unlock. It can be disheartening to get really far then die and lose everything, but that is a facet of the genre. A Robot Named Fight is a real gem, while it took me 4 hours of playing to finally get to the end the replay value is such that it would be many, many more hours before I would have felt I had seen everything, there is so much variation in the layouts and weapon unlocks. 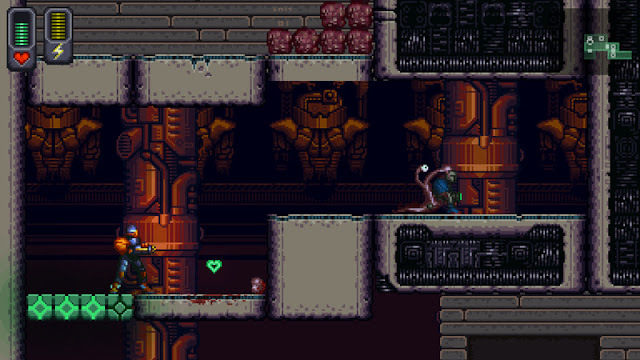 The Super Metroid feeling is not accidental at all, everything from your character's design, to the doors you shoot to progress from room to room is very reminiscent of that style of game, it even features the same save rooms at time (though in a roguelike twist they only revive you once before breaking down). This plays like a dream and was a healthy dose of the real golden age of video games (for me anyway) the beautiful days of the 16-bit era. A Robot Named Fight came out on Steam on September 7th. One last thing to mention; this features a co-op mode that while I didn't try is a cool addition none the less.